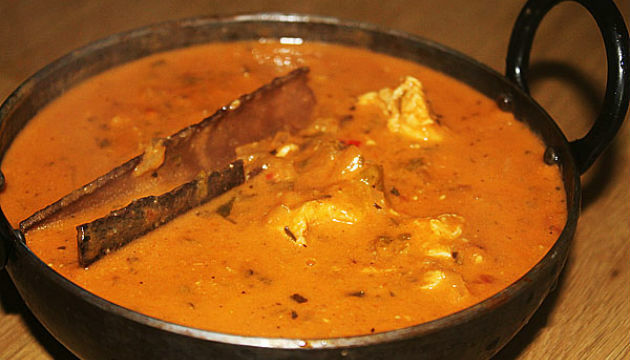 Mulligatawny is a curry flavoured soup in Anglo-Indian cuisine. Mulligatawny is a combination of Tamil words milagu (pepper) and thanni (water). It is similar to rasam from South Indian cuisine. There are many variations on the recipe for mulligatawny. In the West, the soup typically has a turmeric like yellow colour and chicken meat, beef, or lamb meat. Usually it is thickened with lentils or rice. I personally don’t eat meat so I substituted the chicken in this recipe with chick peas. I suspect it would be equally as good with a white fish such as Tilapia. In a 4- to 5-quart slow cooker place celery, carrots, apple, onion, and garlic. Stir in 1 1/2 teaspoons curry powder, the ginger, coriander, cumin, cardamom, turmeric, and cayenne pepper. Pour broth and the water over all in cooker. Cover and cook on low-heat setting for 4 hours. In a resealable plastic bag place chicken, flour, and 1 1/2 teaspoons curry powder; seal bag and shake to coat chicken with the flour mixture. Chill in refrigerator until needed. In a large skillet brown coated chicken in hot oil over medium heat, stirring often. Add three to four ladles of the cooking liquid from the slow cooker to the skillet; stir until thickened and gravylike, scraping bottom of skillet to incorporate flour and spices. Stir chicken mixture and rice into the slow cooker. Cover and cook 1 hour more on low-heat setting. Stir in coconut milk before serving. If desired, sprinkle with crushed red pepper.